At the ISAF conference in Athens we got the clear signal that mixed sailing on multi-hulls can be a new Olympic sailing discipline for the Rio Olympics 2016. With a new website we want to promote and support mixed sailing as best as we can. With your support! Please have a look at www.mixedsailing.org. On the new Website you find information about our sport. It is the beginning of a new era in the Olympic Sailing and we wish to get your support to make it a great sport. Mixed Sailing on Multi- and Monohulls is a well established sport around the world. Also in Olympic sailing. 40% of Top 10 in German Tornado Crew Ranking list is Women (from 81 Crews)! 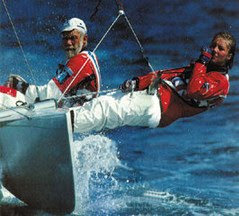 Our ultimate sailing Legend Paul Elvstrom places 4. at the Olympics 1984 with his daughter Trine Mixed Sailing can color up the Olympic Sailing a lot. Mixed sailing on the Formula-1 (Multi-hull) can attract the media and spectators too.